As a reaction to the overtly ornate style of the Baroque period, and influenced by Roman architecture seen during their ‘Grand Tour’, aristocratic Georgians developed a taste for what became known as Neo-Classical designs where elegance and symmetry became emblematic. 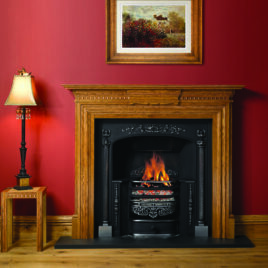 The Stovax Kensington Insert fireplace characterises this era perfectly. The only difference is that today you can choose to have a gas fire complete with remote control if you do not wish to burn logs or coal. The Stovax Knightsbridge Insert fireplace symbolises the Baroque era perfectly. With its overtly ornate design, this fireplace exudes elegance that was seen during the influence of the Roman architecture during their ‘Grand Tour’. 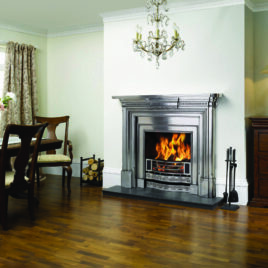 The Stovax Knightsbridge Insert fireplace is available as a gas fire. 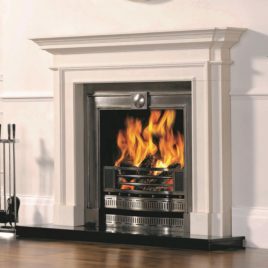 The Regency Hob Grate Insert design in the Stovax Classic Fireplaces range was originally produced circa 1827, during the reign of George IV (formerly the Prince Regent). The ‘hobs’ either side of the grate were used for small saucepans and kettles, making this fireplace particularly appropriate for dining rooms as well as living rooms. The Regency Hob Insert fireplace is available in traditional matt black or highlight polished with the options of an ashpan cover and gas fire.